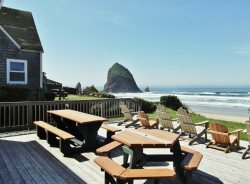 The City of Cannon Beach limits us to one guest rental every 14 days, so Embassy has limited check-in and check-out dates. You may use the online booking function to make a reservation, or please call the CBVR Office at (503) 436-0940 if there are questions. Thank you! Elegance and family-friendliness fit together hand-in-glove at Embassy, a handsome three-bedroom, two and one half-bathroom beach home ideally appointed for grandly-styled family fun. This home exudes an ambassadorial flair with its cascading windows and impressive exterior, but your whole brood will feel instantly at home as they cross the threshold into its rambling, open-plan downstairs living space, seemingly tailor made for togetherness: a massive kitchen with sweeping counter-tops and two bar areas proffers plenty of space to accommodate those communal cooking efforts, while the large living room features an enormous, custom-built stone fireplace, a puzzle table, and countless nooks perfect for spreading out and getting comfortable. An abundance of dark wood, leather and stone accents throughout Embassy lend this home the feel of a stately captain’s quarters, and with the ocean just one quick and easy block away, you’ll have ample opportunity to ponder the expanse of the ocean, as if at the rudder of your own tall ship. You’ll feel like the lord of all you observe in the quiet upstairs den, which proffers of a bird’s eye view of the downstairs living areas. When you’re ready to disembark, of course, all the amenities and entertainment of downtown Cannon Beach are just short walk down the road. Ready to rest those weary bones? Every member of the family is sure to be sitting pretty come evening time, thanks to this home’s unique collection of sturdy and distinctive furniture. Among the perches: thick, wooden bar stools, cozy leather sofas, a window-seat with peek-a-boo ocean views, and artisanal rocking chairs for those partial to the soothing pitch and reel of the sea. The downstairs master bedroom features a spacious, private bathroom and sliding doors that open right to the backyard, while two additional upstairs bedrooms offer king-sized and bunk bed options. The backyard features a party-sized deck, plus a lush lawn and a play structure built right into an old tree. This is one high-seas getaway the entire family will enjoy. Thanks for making our vacation a great trip! We'll be back:) Thank you. Thank you for releasing the facility to us for 3 nights, instead of the required 4-minimum stay. That additional night becomes too lengthy for our calendars, yet I sympathize with the heroic efforts of your cleaning crew--a job they wouldn't wish to tackle too frequently. For guests who aren't as messy as other groups, I, for one, would make a concerted effort to leave the place neat & tidy, especially if part of a cleaning deposit might be reimbursed. But I suppose that could invite disagreements. We did leave it quite orderly, however, because I couldn't leave it any other way for you & your employees. Many times websites overstate the quality of a home with words or photos. The information we found on line perfectly matched what we found at this house, "The Embassy." We had a great time.